Steve retired last year from his job of 30 years. Finally, he could do what he wanted, whenever he wanted. No more kids to take care of and no job to go to. So, for the next six months Steve sat on the couch and watched all his favorite shows and sporting events. He enjoyed his new leisurely lifestyle until one day he realized that it was affecting his health. Physical tasks that used to be easy and effortless started to tire him. It got harder for him to get up from the couch (it took him multiple tries instead of one), his low back started hurting him whenever he walked (making him hunch forward) and he became short of breath whenever he walked up or down his stairs at home. None of those activites had ever remotely been a problem in the past. Steve wasn’t the only one to notice what was happening to him. His wife Sandra, was so worried by Steve’s declining health that she decided to intervene. Sandra had read a few articles about how dogs are good at motivating people to exercise more. So, on Steve’s birthday, she came home with the German Shepard that he had desperately wanted as a child, but his parents hadn’t allowed him to have. Steve knew that Sandra had never wanted a dog, so he was going to be the one caring for it. Sandra hoped that having the dog he had always wanted would motivate her husband to move more. How can a dog promote exercise and health? Studies have shown that people who own dogs tend to be more active than those who don’t. Here are a few reasons why. Dog needs daily walks: A dog needs a walk everyday. It doesn’t matter if it is cold, windy or rainy outside. They count on you to take them outside for their walk. They accept no excuses. Great workout partners: You always have a companion that is enthusiastic, full of energy and ready to exercise. It’s hard to say no to exercise when looking into those big, brown eyes pleading with you to play with them. Social networking: During your walks, you will most likely see other dog walkers. Building those active social connections with other dog walkers helps to keep you motivated to continue your daily walks. Also, in almost every city, you will find community events, such as dog fairs, dog meet-ups and dog runs/walks, where you can meet other people like you who are active. Dogs push you to walk faster and farther: Dogs tend to be full of life and push you to walk faster and farther than if you didn’t have a dog. 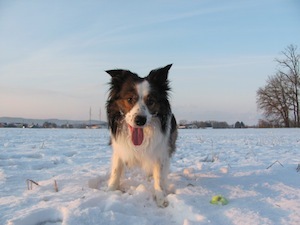 More frequent park visits: On top of walking your dog, you might like to engage in other games with him, such as frisbee tossing and ball fetching, and you are more likely to visit a park to do those activities. Dog food can be heavy: Lifting 40 pound bags of dog food can help keep your muscles strong as you get older. If you want to lift more weight, get a bigger dog. You’ll need to lift more bags of dog food more often. If you find yourself having a hard time getting motivated to exercise, a dog might be what you need to get you going. Taking care of a dog requires you to be at least a little active on a daily basis. And after a while, you will see that there is actually more happiness in life when you are out and exploring it with your dog than when you are sitting at home watching other people live their lives on television. That is a good idea if you need motivation to exercise. Couldn’t agree more. These fur balls have better stamina and speed than humans so they’re the best at motivating you to move and be more agile. They also don’t complain. They will eagerly run with you or play with you. Expect a lot of sweating if you decide to play with a canine pal. Exactly right, although I hope people don’t get the wrong idea of getting a dog just to exercise more. You should get a dog because you want to raise it, love it and feed it. Anyways great article.